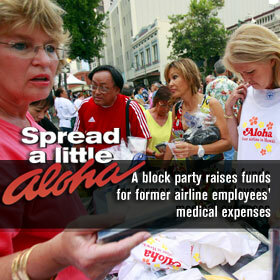 Jayne Doole, left, sold Aloha Airlines souvenirs on Nuuanu Street yesterday as Carmella Hernandez looked over a shirt during yesterday's block party held in honor of the defunct airline and its employees. The trustee for the bankrupt airline wants union contracts declared invalid. Rejection of a $200M settlement was the Legislature's biggest failure, according to Gov. Linda Lingle. A 70-pound marauding pit bull in Central Maui bites the neck of a 7-pound dachshund. The Board of Water Supply will add a power cost adjustment to the monthly water bill beginning July 1. A minimally invasive procedure assists a Kailua man with an irregular heartbeat. Rainbows win opener against Sacramento State, but lose their ace to an arm injury. The land is in addition to the 2,000 acres it has already agreed to sell this summer. Congress has cleared a measure to ban discrimination based on genetic information that shows disposition to certain diseases.